Well, it's the week of St. Patrick's Day, and we have one of our customer-favorites...Corned Beef! We just got it in on Monday, and we're ready to sell it! There are a lot of our customers that look forward to this every year, and we're getting more and more people that have tried it elsewhere, but to no avail. Just like a lot of things we handle, we find a great source for a product, and we stick with it. The Corned Beef Brisket is no different (recipe below)! The difference between the Point and the Flat is that the Point has more fat in it. The Flat is the most-preferred part because it's leaner, hence why it's more expensive, not that the Point is bad, it's just not the preferred section of the Brisket. 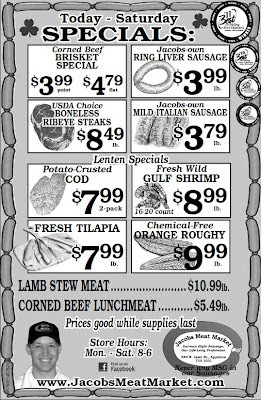 If you're not in the mood to cook the Corned Beef, we have the Lunchmeat on sale as well for making Reuben sandwiches. Also on sale are Ribeye Steaks, our Mild Italian Sausage (great on pizzas, Spaghetti, spicing up Meatloaf or grilling), and our Ring Liver Sausage (made the same way for the last 66 years). 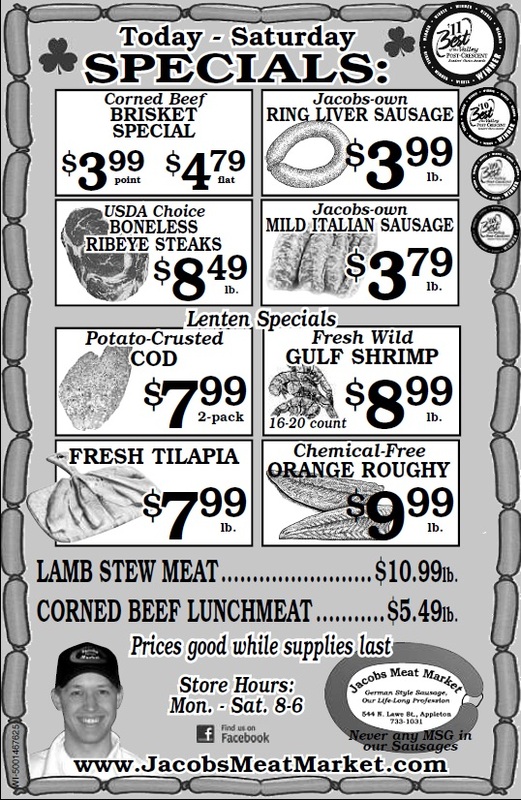 In addition to all of the "Meat" specials, we have the seafood specials as well. We have the ever-popular Fresh Wild Gulf Shrimp and Potato-crusted Cod. This week we also have Orange Roughy and Fresh Tilapia. Both a little milder fish that are great pan-fried or baked! Open white package near the pan you're going to cook the Corned Beef in so you can put the juices right in the pan so you don't lose the juice from the "corning" process. Put Corned Beef in pan and cover with Water until the Beef is covered. Add Cabbage and Carrots around the roast and cover with cut-up Onion. Bake in oven tightly covered for 5-6 hours at 275 degrees. Slice Corned Beef and put on plate with Carrots and Cabbage and enjoy! Murphy and his wife, a middle-aged couple, went for a stroll in the park. They sat down on a bench to rest. They overheard voices coming from a secluded spot. Suddenly Mrs. Murphy realized that a young man was about to propose.